At the age of ten, Annie Todd finds not only is her mother quite mad but that Annie has inherited an unusual legacy. The ghost of a young girl visits Annie in her new home deep in the mountains of Western North Carolina, where Annie’s mother, Grace Jean, has hidden them away from the life they used to know. Annie finds an unlikely ally in Pearl, a young woman who keeps house in Annie’s new home. The secrets that surround Pearl take Annie’s mind off her loneliness and soon her family history is revealed to her. “Instead of wind, I heard my name being called. The whispery voice came from the woods. ‘Annie Todd’. 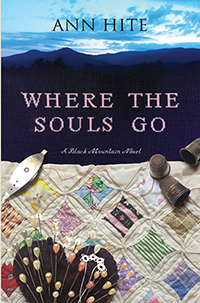 My sixth sense had not yet kicked in and didn’t warn me I was standing on the backbone of my history.” WHERE THE SOULS GO is Ann Hite’s third novel set in Black Mountain, North Carolina. Readers who loved GHOST ON BLACK MOUNTAIN, Hite’s first novel, will find many of the characters familiar. This book follows three generations of the Pritchard family, not only telling the story of how Hobbs Pritchard became the villain of Black Mountain, but highlighting women’s struggles in Appalachia, beginning in the Depression Era and ending in the mid-sixties.